I stopped by the library and while I was making my selection, I noticed a student tapping her foot over at a desk facing the wall. She was intent, focused and tapping away. My attention was also caught by the reflection of the blue soles of the student’s tapping shoes in the polished floor. I did not capture the tapping in this sketch but did capture a bit of the student’s focus with the angle of her shoulders and head. 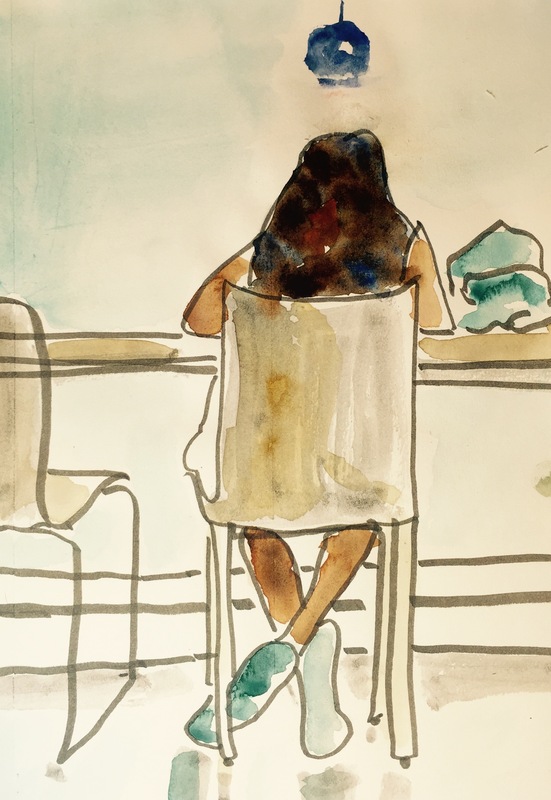 I overdid the splashes of color in her hair and got just about the right amount in the other parts of the sketch, particularly in the left leg, the right foot’s shoe and the chair. After the sketch was dry, I made a quick exit, leaving the tapping sounds behind. This entry was posted in Uncategorized and tagged Splashes of Paint. Bookmark the permalink.